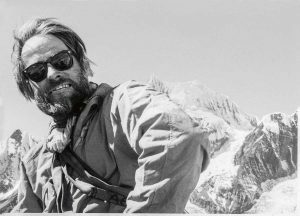 Excerpted from Allen Steck’s new memoir, A Mountaineer’s Life. 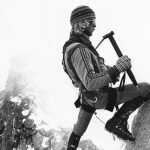 Editors’ note: Allen Steck, born in 1926, has climbed around the world, with first ascents from Yosemite to the Dolomites to the unrepeated Hummingbird Ridge on Mount Logan, the Yukon, in 1965. He was part of a 1954 expedition to Makalu and a 1963 first ascent on the Clyde Minaret. 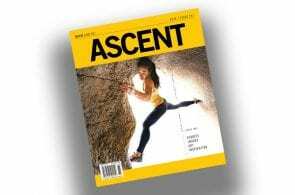 Co-author with Steve Roper of Fifty Classic Climbs of North America and co-founder with him of the literary magazine Ascent, he won the 1995 American Alpine Club Literary Award, aptly shared with—again—Roper. After passing the Ascent baton to Rock and Ice, which publishes the feature compendium annually (the next edition appears April 15), he honored us with a superb feature on his grand tour of serious climbing on great faces in the Alps in post-war 1949. The below is from his new autobiography, A Mountaineer’s Life, which Roper in the foreword teases has taken Steck over 25 years to write. 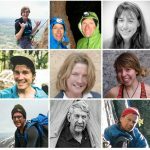 Edited by Michael Kennedy, it covers a lifetime’s worth of climbs and friendships with such climbers as Lionel Terray, Willi Unsoeld, Barry Bishop and Galen Rowell. Steck enjoyed a lifelong friendship with the Austrian climber Karl Lugmayer, his companion in the Alps. The below describes the first ascent of the famous Steck-Salathé on the 1,500-foot Sentinel Rock, taking place from June 30 to July 4, 1950. Steck was 24 and Salathé 51. 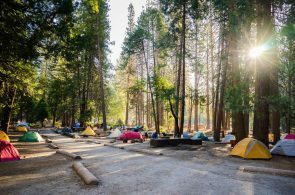 John Salathé and I met in Berkeley and drove to Yosemite in his Model T Ford on June 29, spending the night in our sleeping bags at the intersection of the Four Mile Trail and Sentinel Creek. Early the following morning, after stashing our packs and sleeping bags in the woods near the trail, we made our way up to the Tree Ledge and began the climb. 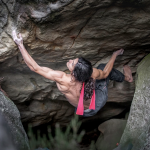 In addition to Salathé’s pitons and some three-quarter-inch army angles, plus some bolts, we had with us my nylon climbing rope, a 300-foot hemp rappel rope, and a 120-foot hauling line (also hemp) to bring the packs up. Food was simple: Salathé had his dates and I brought dried fruit along with nuts and cans of tuna. Our water was in two one-gallon tin cans. We both had our Sierra Club cups. One of the famous chimneys high on the Steck-Salathe. Photo: Michael Kennedy. The evening was calm and rather warm so we slept well despite having no sleeping bags or down jackets. 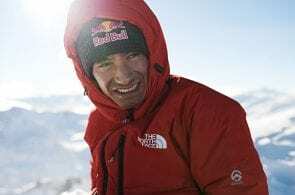 At first light, Salathé again went to work and struggled for seven hours to surmount the steep Headwall. The lead was maddeningly complex. His pitons were barely able to penetrate the marginal cracks and he had to place several bolts. After I prusiked up to his stance, we discussed the problem of reaching the lower portion of the Great Chimney. 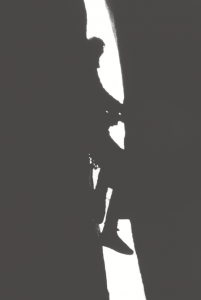 The solution was a tension traverse across a short blank section on the otherwise moderate face. Merced River. This was an unexpected torment; the thought of suddenly finding myself in a cool, fragrant spring was maddening. I knew that Salathé was thirsty as well, but he didn’t say much. One time, though, when he was standing near my belay with his hammer poised over the Star drill, he quietly said, “Ja, Al, shust I vud like a leetle glass of orange chuse.” I could not have agreed more. On reaching the beginning of the Great Chimney our spirits plummeted. A steep, flared slot soared above us, ending in a narrow section that seemed to defy further progress. I was beginning to ponder how we might escape this incredible wall. As our third day was coming to an end, we spied a bivouac site off to the right. Making our way over, we found that the sandy ledge was so narrow that we would be forced to sleep sitting up with our shoulders turned sideways. After an unpleasant night I noticed a cave at the far end of the chimney and went to investigate. The opening was just big enough for me to enter, and I could see a possible way to wriggle upward into the darkness. After roping up, I did just this and soon, after scrambling around in the dark, found myself out in the open again, a hundred feet above Salathé, at the base of the constricted section now known as the Narrows. Because he was too bulky to manage the hidden chimney, I pulled up the rope and threw it down to him. Soon he prusiked up to my stance. He had left behind an empty water can plus some dates that he figured we wouldn’t be wanting because of our intense thirst. For many years, subsequent parties would see the can, with its mantle of rust, as they entered the Great Chimney. A menacing slot about the width of a human head rose above us. No way for us here. There seemed to be a way on the outer wall where the chimney was wider. 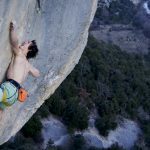 As on the Headwall, cracks were rare, but Salathé managed to place some pitons that only someone with his skill could achieve. He eventually reached the outer face of the chimney and climbed onward, placing a few bolts, to an ample ledge where he yodeled down to tell me the good news. As I was getting ready to follow, I noticed a small mossy crack glistening in the shadows. I watched, my lips tight and drawn, as a little bead of water seeped out of the crack and slid smoothly down the rock. The trickle was barely enough to moisten my lips—a brief, wonderful sensation. I managed the pitch without too much trouble and soon we were both looking upward at the more gentle terrain above. We could see some steep chimneys farther up the cliff. 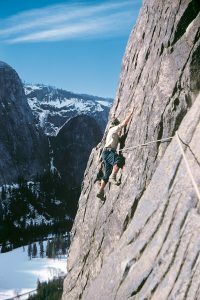 The author on the first ascent of the East Buttress, El Capitan. Note that he is tied directly into the rope: “No harnesses in those days,” he says. Photo: Allen Steck collection. We were only two pitches from the summit when the day ended, and were forced to endure a painful bivouac hanging in a seated position from our anchors. In the morning there was one-half cup of water left and Salathé had to use his share to moisten his false teeth so they could slip into his mouth. Facing us was the last problem of the climb, a fifteen-foot vertical wall of slightly loose rock. I led this by placing several pitons for direct aid, and soon Salathé and I were lounging on the summit. It was about noon on July 4, our fifth day on the climb. Our visit was brief, for the ordeal was not over. The awful thirst! We could see the thin, foamy line of Sentinel Creek and hurried on in desperate haste. I decided to rush down the gully leading to the stream while John traversed over to the water. I lost sight of him and in my haste missed a crucial bend in the gully. Some 200 feet lower I ended up at a steep, rocky face some thirty feet above the stream. It was steep enough that I would have to jump. I was not so far gone that I didn’t realize I would break some bones, so I struggled back up through the hot, dusty brush until I reached the gully again. My judgment was numbed by the thought of water. I tripped over bushes, fell over unseen ledges, and finally collapsed fully clothed into a pool at the foot of a small waterfall, took out my cup and poured water over my head until Salathé showed up. We now faced the complex descent over steep, water-worn granite slabs down toward the Valley. Eventually we found our way to the Four-Mile Trail and a little farther down, our cache. We discovered that a bear had torn everything apart, including our sleeping bags. Salathé’s Model T was a welcome sight. We motored on to Merced, where we stopped at a produce stand. John bought copious amounts of various fruits and I, too, ate them eagerly. 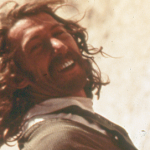 Excerpted from A Mountaineer’s Life by Allen Steck. 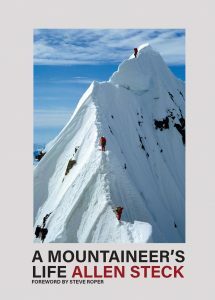 A Mountaineer’s Life is available on Patagonia.com/books, Amazon.com or at bookstores or Patagonia stores, $35.